The Oregon Rex was one of several breeds of Rex cats which in the mid-20th-century occurred from spontaneous genetic mutation. After its acknowledgment as a separate breed, it enjoyed a short time of popularity among cat breeders in the United States. 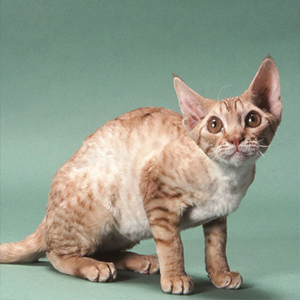 By now, due to crossbreeding with other Rex types, this breed seems to have merged with the other more popular Rex breeds like Devon Rex or Cornish Rex. The Oregon Rex combined the character traits of all Rex breeds. They were affectionate and needy, funny and playful, sometimes a little turbulent, and a little arrogant. The Rex was also reported to have a dominant character and thus to be somewhat complicated to handle.